IN TRINITY SQUARE, in the City of London, stand the headquarters of the Corporation that is responsible for the safeguard of British shipping in home waters. The present building, illustrated above, was built in 1796. IT is reasonable to claim that no organization in any way connected with shipping has a more romantic and interesting past, or a more practical present, than the Corporation of Trinity House in London. This body has a position different from that of any other organization in the world. In other countries than Great Britain corresponding duties are mainly carried out by Government departments, but some of the duties of Trinity House are individual to the Corporation. Unfortunately it is impossible to trace back to a really satisfactory source the history of Trinity House; fire has destroyed so many of its records. It may be - and there is considerable support for the supposition - that its history goes back to the days of Alfred the Great, when he risked fighting the Norsemen at sea and demanded the finest possible seamen for the purpose. There is definite evidence that in King Alfred’s day there existed a body that fulfilled many of the earlier duties at least of Trinity House, but it is uncertain whether this body was allowed to disappear by the less provident kings who followed Alfred, or whether it contrived to carry right through to the present day. The student is on firmer ground when he claims that the Corporation is founded on the Trinity Guild formed by Stephen Langton, Archbishop of Canterbury, in the twelfth century. This theory is the one generally accepted. Langton was the practical cleric-administrator of his time, and the See of Canterbury was intimately associated with ships and shipping in many ways, mostly to do with its revenue. The Trinity Guild seems, therefore, to have been formed for many purposes. One of its principal duties was to check the pillage of wrecked ships. The poorer people, to whom a wreck was a godsend, could see no harm in this practice, but it produced severe retribution from the parties - both ecclesiastical and lay - who owned the rights of wreck. The Guild proposed also to provide navigation marks and to help poor mariners. For many years the only lighthouses on the British coast, of which the Romans had taken particular care, were those maintained by odd chantries and monkish institutions. The light was generally a coal fire burning in an open brazier on the cliff-top. As most of these beacons were independent, and far later in date than Langton’s time, it seems that his Trinity Guild did not carry out all its promises, although it certainly did excellent work in helping mariners who had fallen on evil days. Just how and when the guild came to settle at Deptford is another historical question that cannot be answered, although it is certain that a kind of college, with almshouses, existed there well before the days of Henry VIII. The college is said to have been owned by a guild of pilots and seamen who were empowered by charter to preserve seamarks, but there is no trace of this charter or evidence of the king who granted it. But there is every evidence that some body of the sort existed, for the Thames pilots were well organized towards the end of the Middle Ages. Moreover the rapid increase in overseas trade and the length of ocean voyages, brought about by the improved design of ships which facilitated beating (making headway against the wind), demanded safeguards which the Tudor sovereigns, with their appreciation of trade and navigation, were not likely to have left unsatisfied. We are in considerable doubt as to the exact sequence of events, even in Henry VIII’s day. Tradition has it that the institution was reorganized by Sir Thomas Spert in the year 1512, and the inscription on Spert’s tombstone is that he was “Founder and First Master of Trinity House”. Unfortunately, largely because of the fire danger already mentioned, there is no real confirmation of this, although from what we know of that enterprising gentleman it is possible. Spert is described in some records as a shipwright; in 1512 he was certainly a yeoman of the Crown, drawing eightpence a day out of the petty customs of the Port of London; in 1513 he was in succession master of the Mary Rose and of the Henry Grace a Dieu, two of the finest ships in the King’s service. He was knighted in 1529 and died in September 1541. Whatever Spert’s connexion with it may have been, it is certain that the establishment was chartered by King Henry VIII at Westminster on May 20, 1514, as the Guild of Holy Trinity and St. Clement. Apart from other evidence it is obvious that this charter was not so much an original foundation as a reorganization and an improvement. Great attention was paid to the pilotage service of the London river. Long before 1514 the outward-bound ships had found their pilots at the Deptford headquarters, and the inward-bound ships had gone to the branch establishment at Leigh in Essex. The earlier organization must have been loose and the new charter made many stipulations. There were to be one Master, four Wardens and eight Assistants. The Trinity House Brethren Were to be exempt from land service, a confirmation of an ancient right that is still in force, and all surplus income was to be spent on charities connected with the sea. This was only a recommendation in the first charter, but was made compulsory in later ones. Everything appears to have been thought of except the provision of an income that would permit all the work to be carried out. The foundation was a particular favourite of Henry VIII, who had a fine appreciation of the value of sea power. In spite of its distinctly religious character, it was left unmolested at the dissolution of the monasteries. The advisers of the boy King Edward VI, however, were not so broad-minded. The name was hurriedly changed to the Corporation of Trinity House on Deptford Strand, to avoid spoliation in company with the other religious guilds that had been spared by the late king. The charter was confirmed by Edward VI soon after he had come to the throne, and again by Queen Elizabeth in the first year of her reign. Eight years later an Act was passed which empowered Trinity House to erect seamarks at its own expense and to grant licences to mariners to row on the Thames. Christ’s Hospital was then largely a mathematical school, and as few boys troubled about mathematics unless they intended to be navigators, the Brethren of Trinity House were called in to examine the boys of the school in navigation and mathematics. The Corporation’s experience was used also in the building of the various piers and harbours of refuge in which the Tudor monarchs were interested. On one occasion, the Brethren took action in Parliament to protect the harbours of Devonshire and Cornwall from injury through the operations of the tin miners. Queen Elizabeth found more than one opportunity to compliment the Brethren on their knowledge and their value to the nation. She was always ready to take full advantage of them, but does not seem to have taken any steps towards giving them a regular income. Although they must have charged for many of their services, it is difficult to see how they raised sufficient money for their various enterprises. It was not until 1593 that Lord Howard of Effingham, Lord High Admiral of England and Commander-in-Chief of the fleet that defeated the Spanish Armada, came to the rescue of the Corporation. He voluntarily surrendered two of the most valuable perquisites of his high office - the right to dig ballast in the Thames and place it on board outward-bound sailing ships that had discharged their cargo, and the dues from buoyage and beaconage. The measure of his generosity may be judged from the value of the concessions and from the general acquisitiveness of Tudor courtiers. Lord Howard of Effingham could surrender these perquisites only to his sovereign, but the enthusiastic Queen was willing to accept them with the condition that they were to be bestowed on Trinity House for ever. James I possessed neither the knowledge nor the enthusiasm of Queen Elizabeth, but his advisers made him realize the importance of Trinity House. A new charter, granted in 1604, made great alterations. Under this charter the governing body consisted of a Master, four Wardens, eight Assistants and eighteen Elder Brethren who had the burden of management. The Corporation was also given the sole right of placing seamarks, but when the King realized that he was losing an opportunity of making money, this right lapsed. Many individuals, foreseeing profit, placed lighthouses on various parts of the coast, and reimbursed themselves by charging a toll based on the tonnage of every ship that passed their lighthouse and therefore made use of it. These tolls were the main object of every speculator, but collection proved difficult and the lighthouses were generally ill administered and gave such a poor light, if they were lighted at all, that they were practically useless. Trinity House, which was an excellent organization to take this in hand, could only stand aside and watch exclusive rights on the most dangerous coasts given to persons whose last consideration was the safety of shipping. In self-protection its only course was to fight every suggestion for an independent lighthouse. The Corporation is now often accused in print of having deliberately obstructed measures for the safety of the seamen. Some of the reasons given for its alleged attitude appear to be curious nowadays, as indeed they must have been when they were put forward by practical sailors with their tongues in their cheeks. As there was not so much money to be made out of the other sections of the Corporation it was left in peace to carry on with the training and examination of pilots, the education of navigators for the King’s service, such hydrographic work as the Navy of that day undertook, expert advice on the design of new men-of-war, the proper survey of ships earmarked for buying by the Navy, and, occasionally, the organization of the press gang. The naval dockyard and stores at Deptford were put under the Corporation’s charge. THE ELEGANT LINES of the former Trinity House yacht Irene, the predecessor of the present yacht Patricia, are shown to the best advantage in this photograph taken at the Yarmouth Depot in Norfolk. 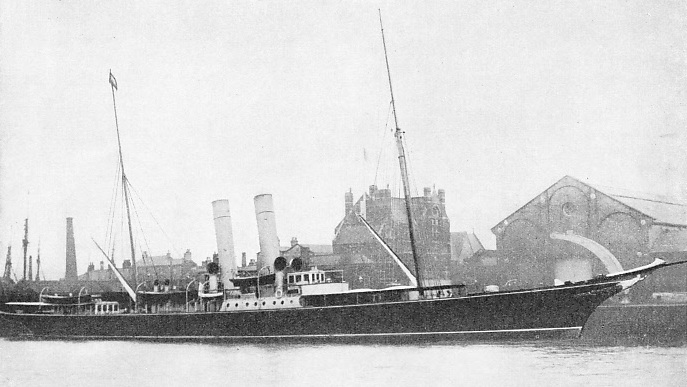 The Irene, 543 tons gross, was built in 1890, and was blown up by a mine during the war of 1914-18. The only personal privilege that the Elder Brethren enjoyed in return was exemption from military and jury service. They were constantly making new jobs for themselves or, as it would appear to-day, interfering in matters that scarcely concerned them. For instance, in 1621, the Elder Brethren used their influence to try to compel the East India Company to pay to their seamen the agreed wages, and to their seamen’s widows the arrears of pensions that had been allowed to lapse. The Brethren realized that the seamen of the East Indiamen were the only trained and disciplined seamen in the Merchant Service of that day. These men were therefore invaluable as a Naval Reserve and deserved fair treatment. Among other miscellaneous work, in 1627 the Brethren were called upon to advise Charles I in his project of building a gigantic ship. This they considered would be too big for any port in England, and they persuaded him, for the moment, to substitute two smaller ones. In the following year they were called upon to find three hundred good seamen and twelve qualified masters for the Navy. In 1631 they subscribed £1,320 for an attempt on the North-West Passage, and in 1636 we find them actively engaged in the salvage of wrecks. This may have been because of their early liability to keep the fairway clear for shipping. At the beginning of the seventeenth century they were probably the busiest and most efficient organization in the country. Although Trinity House was not a Government service at all, the Puritans were jealous of its position when they came into power. They passed an Act of Parliament in 1647 dissolving the Corporation and cancelling its charter. The work was to be carried on by a commission. The patriotism and enthusiasm of its members, however, preserved the organization of Trinity House, and by that time there were two divisions, one at Deptford and the other at Ratcliffe, part of the modern Stepney. As soon as the monarchy was restored, Trinity House came into its own again. Charles II and his brother James fully appreciated the work that was done. General Monk, who had been greatly instrumental in bringing about the Restoration, was elected Master. To facilitate the undertaking of additional responsibilities, the headquarters were moved to Water Lane, in the City of London. The other houses were still retained. In the year of his restoration, Charles II granted a new charter on practically the same lines as that of James I; but Charles II was not rich enough to give it the boon it wanted most, the suppression of all the irregular lighthouses. Although the Corporation flourished in the sunshine of Royal favour, it had its share of ill-luck. During the Great Plague of 1665 the Corporation moved down to its Deptford house, but did not avoid heavy casualties. In the following year it had to move again, for the Water Lane house was destroyed in the Great Fire and with it the records that would have been invaluable. The Deptford house was in poor condition and had to be rebuilt. It was not until 1670 that the new Trinity House in Water Lane, far more imposing and commodious than the old, was ready for occupation. The house at Stepney was then leased to a doctor, although the Corporation retained its interests there and at Deptford. The success of General Monk as Master appears to have shown the Corporation the value of similar appointments. Some of the later appointments were merely complimentary, but others were most useful because of the enthusiasm for science and discovery which had become fashionable. John Evelyn, for instance, who was made a Younger Brother in 1673, was an amateur scientist of no little note. Samuel Pepys was made Master in 1676 and in 1685. He was a born administrator and greatly increased the efficiency of the organization. He also formed an invaluable link between the House and the Navy, and took greater pride in his office of Master than in any other position he filled. It was during this period that the Corporation found a site where a lighthouse was badly needed for the safety of shipping and where the conditions made it too expensive for private speculators. In 1680 it set about building its first lighthouse - in the Scilly Islands. Five years later, James II gave it a new charter, extending its powers, but he could not bring himself to sacrifice the income he drew from the irregular lighthouses. A seaman himself, he enlisted the aid of the Corporation on many occasions for the improvement of the personnel of the fleet, especially in matters of navigation. 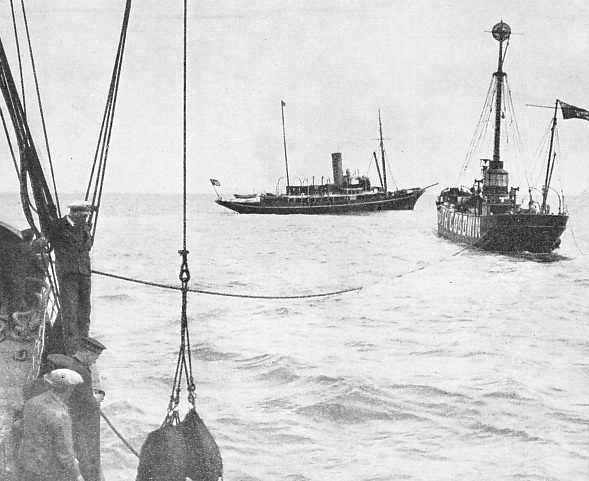 COAL FOR THE SOUTH GOODWIN LIGHTSHIP is being lowered from the deck of the Alert. The lightship is a vessel of 271 tons, and her light shows two white flashes every thirty seconds In the background is the Trinity House yacht Patricia. a suit and hat from the Corporation and every woman a length of dress material. Nowadays master mariners, their wives, widows or unmarried daughters are provided with a cosy cottage and supplies of coal. Every couple is given a pension of £50, and spinsters or widows £35. In the late seventeenth century the Corporation of Trinity House enjoyed the then unusual distinction of being clear of corruption. At the same time the Brethren must have been difficult to handle in committee. The Elder Brethren were all drawn from the ranks of the Younger Brethren; the Master and Deputy Master were chosen almost entirely by seniority from those who had served as Upper Warden. A fine of £10 was imposed on any qualified Brother who refused to serve as Deputy Master; for refusal to serve as Warden or as Assistant the fines were £3 6s. 8d. and £2 10s. respectively. The annual salary was £10 for a Deputy Master, £4 for a Deputy Warden and £3 for an Assistant. All meetings were held under a pledge of complete secrecy, with a fine of £10 as a penalty for the first offence and dismissal from the Corporation for the second offence. Complete silence prevailed when the Master was speaking and any Brother who used profanity had to put sixpence into the poor-box. In 1714 Trinity House in Water Lane was again destroyed by fire. It was immediately rebuilt on a fine scale, but in fewer than eighty years it was in a bad state of repair. George II granted a further charter in 1730, and thirty-five years later the hall at Deptford was rebuilt. From that year until 1852 the members of the Corporation were rowed in state barges from the Tower Wharf to Deptford Green every Trinity Monday to elect the Master and Wardens for the following year. Although the picturesque river trip has been discontinued, Trinity Monday is still as important day in the year of the Corporation, with its elections and special church services. 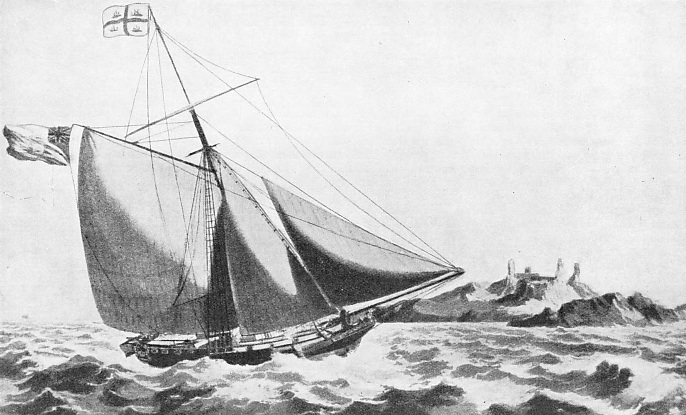 The right to dredge ballast out of the Thames and to sell it to sailing ships provided the Corporation with necessary funds in its early days. By the middle, of the eighteenth century, however, ships had increased so much in size that dredging became necessary for a different reason. Trinity House maintained that the conservancy of the River Thames was a liability in the hands of the City of London, but it was willing to co-operate for the benefit of shipping. In 1776 an Act was passed to permit the employment of convicts on the Thames for the benefit of navigation under the control of Trinity House. They were employed on ballast dredging. Before the days of steam dredgers the work had to be done with huge spoons at the cost of back-breaking manual labour. When the Fleet at the Nore mutinied in 1797 the Elder Brethren went down the river themselves and removed all the buoys, beacons and seamarks of the Lower Thames to prevent the mutineers from navigating their ships in an attack on London. Six years later, when the country was in fear of an invasion from Napoleon, the Brethren raised a large force of trained seamen and commissioned ten frigates that had been laid up in the dockyards for lack of men. They formed a cordon across the Lower Hope below Gravesend Reach and maintained it as a defence until all fear of invasion was over. The Elder Brethren commanded the ships and kept them in fighting trim. Naval officers were appointed to take command in the event of an action, but meanwhile they were stationed in one of the Royal yachts to amuse themselves with their cards and yarns while the Brethren prepared the ships. A CYLINDER OF GAS being lifted from the West Mouse Buoy, in the West Swin Channel of the Thames Estuary. This buoy contains two cylinders of gas as fuel for the light, which shows two quick, white flashes every ten seconds. The buoy has been lifted on to the deck of one of the Trinity House service vessels that are constantly inspecting and refuelling the beacons round the coasts of Great Britain. The old headquarters in Water Lane were abandoned after the opening in 1796 of a new Trinity House in Trinity Square. The Corporation soon increased its scope and its reputation. When the concession and lease of Smeaton’s Lighthouse on the Eddystone expired in 1810, Trinity House took over its management and immediately replaced the old candles with improved oil lamps and reflectors. The lighthouses under the control of the Corporation had the reputation of being the best on the coast. Until 1836, however, there were still numbers of the old private lighthouses that levied independent tolls. In 1836 an Act of Parliament gave Trinity House the right to buy them all, from the Crown or from private owners, and to take over the entire control of seamarks. While this reduced the difficulties of the Corporation it certainly increased its work and the next few years were particularly active. The Duke of Wellington was appointed Master in 1837, and held this position until his death in 1852, when the water procession to Deptford was abandoned. In 1853 numerous alterations were made. The Cinque Ports pilotage service was transferred to Trinity House and the direct control of tolls and dues was transferred to the Board of Trade. In 1864 there were more changes. The care of navigation marks in the Thames was transferred to the Thames Conservancy, only to return to Trinity House in 1878. The historic right of ballast licences also went to the Thames Conservancy, and was later transferred to the Port of London Authority. At that time Trinity House had a fleet of steam dredgers and barges. The Duke of Edinburgh, second son of Queen Victoria and a really practical sailor, became Master of Trinity House in 1866, a position in which he took great pride. Three years later the Prince of Wales, later King Edward VII, became an Elder Brother and took a keen interest in the Work. Additional duties were taken up, as well as the administration of numerous charities, and professional examination of all navigating officers for the Navy. In 1894 another sailor prince, Prince George, who afterwards became King George V, was made Master, and he held the post until he ascended the Throne in 1910. He was succeeded by his uncle, the Duke of Connaught, who had been made an Elder Brother in 1898. King George’s interest was illustrated by the Royal Warrant of 1912 which empowered the Elder Brethren to use the title of Captain and to take precedence immediately after captains of the Royal Navy. In other branches of the Merchant Service the title Captain is one purely of courtesy. During the war of 1914-18, Trinity House was able to do an immense amount of useful work in connexion with navigation and seamarks, and it now enjoys a reputation probably higher than ever before. The Mastership of Trinity House is still given to a distinguished layman. There is no salary attached to the position. The really active head is the Deputy Master, who is backed by nine active Elder Brethren elected from the ranks of the Younger Brethren. Of these there are about 300, admitted only after strict scrutiny of their claims. They have neither duties nor salary, but they must be masters in the Merchant Service or officers of at least Lieutenant-Commander’s rank in the Royal Navy. They have no voice in the management of the Corporation, but are entitled to vote at the election of the Masters and Wardens on Trinity Monday. In addition to the active Elder Brethren, there are a number of honorary members who do not pretend to be seamen, but are men of eminence in the country. An honorary member is proud of his position as Elder Brother and of the uniform that goes with it. Prime Ministers and First Lords of the Admiralty are frequently made Honorary Elder Brethren. Practically the whole of the cost of the work of Trinity House which deals with lighthouses, lightships and other aids to navigation is covered by “light dues”. These are levied on the ships which benefit, and are collected before the vessels leave British ports. In most other countries these costs come out of the general taxation of the country, but in Great Britain it is only the shipping industry, British and foreign, that is so taxed. The light dues are collected by the Customs and paid to the Board of Trade, on which Trinity House has to budget for its necessary income. 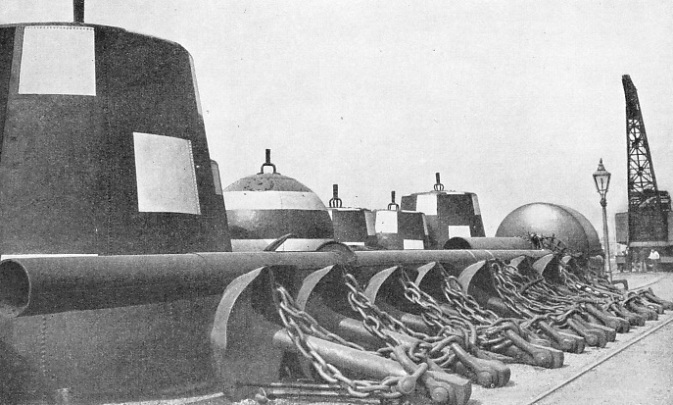 photograph indicates the size of the buoys. For administrative and practical purposes, the Elder Brethren have divided the coast into seven districts. Every district has its headquarters, with a wharf on which gear can be stored, and from which the necessary maintenance work can be done. The repainting of buoys involves constant work, for their utility depends on their being easily recognized. At the depots an adequate percentage of spares is maintained for each type of buoy. Many repair jobs are carried out at the district headquarters, but, when a lightship is taken off her station and temporarily replaced by a relief boat, it is generally necessary to send her into a properly equipped dockyard or outside shipyard. The work in the depots is done by a small staff on permanent duty, assisted by the lighthouse men who are doing their month ashore after two months afloat. Every district has its sea-going tender. Each tender is kept ready to go to sea at short notice, so that as soon as a report is received that a lightship is in trouble or that a buoy has broken adrift or lost its light, she can be on her way to put things right without a moment’s delay. These ships generally have a skeleton crew which is brought up to strength from the men on shore. The tenders have black hulls and yellow funnels, and until recently, following man-of-war fashion, had their names painted on the stern only. They carry the historic Trinity House Red Ensign with the four Tudor ships in the fly - that part of the flag farthest from the staff. Practically all the tenders are steam-driven, with a good speed and remarkable seaworthiness. Diesel propulsion has been introduced in the latest tenders, the Reculver and Strathearn, based on Yarmouth and Harwich. The two tenders in the London district are reinforced by the Trinity yacht Patricia. She was bought by the Corporation after the war of 1914-18 and renamed in honour of the Master’s daughter, Princess Patricia. The yacht’s foremast has been adapted to accommodate derricks capable of lifting considerable weights when she is on maintenance duty. One of her duties is to carry the Elder Brethren on their periodical inspection of the depots, lighthouses, lightships and buoys. During this inspection the Elder Brethren personally inspect and check every seamark under their control. A new (motor) ship is being built for this work. Trinity House is the senior pilotage authority in the kingdom and, when the king embarks for ceremonial purposes, the Patricia has the proud privilege of leading the procession. 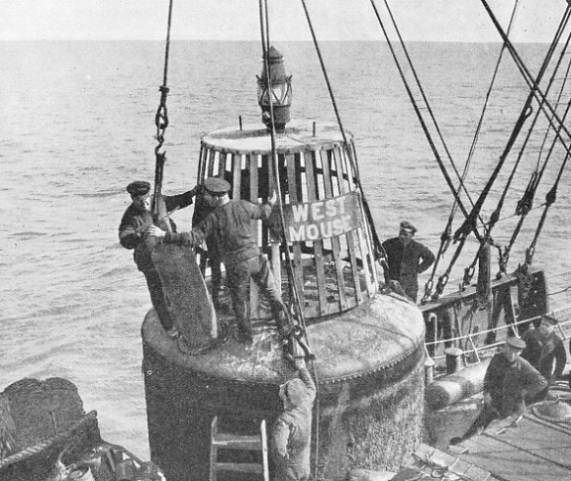 She was bought to replace the famous Irene, which was blown up during the war by a mine in the Thames estuary. 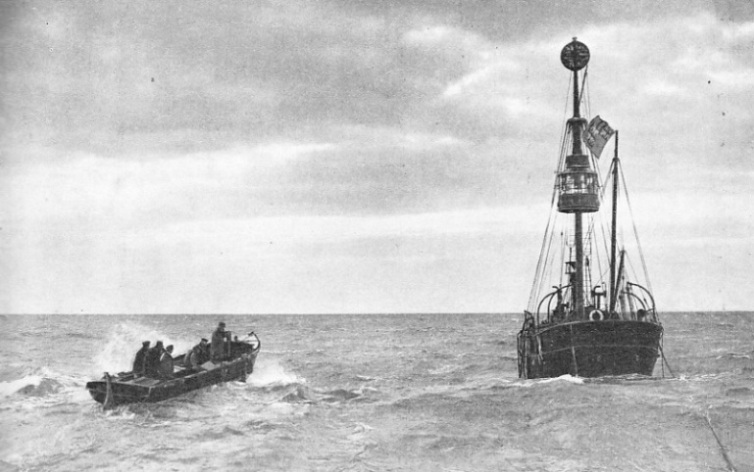 The maintenance of the navigation lights and buoys round the coast of Britain is only one of the liabilities of the Elder Brethren of Trinity House. They are ready at all times to co-operate with the executive bodies which are entrusted with similar work in various parts of the Empire, and this co-operation involves an immense amount of work. 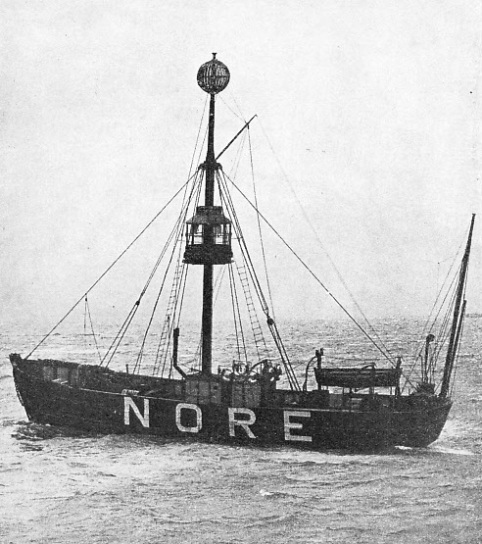 THE NORE LIGHTSHIP marks the end of Yantlet Channel in the Thames estuary. Her light, one white flash every thirty seconds, is normally visible from a distance of eleven miles. In common with other Trinity House lightships, she is equipped with a reed horn, which sounds two blasts in quick succession every two minutes during foggy weather. must be admitted into the service. After selection, the Elder Brethren have to arrange for the pilots’ annual medical and professional examination. They have also to maintain discipline, settle disputes, examine accounts, and do the thousand and one other things that are - necessary if a complicated service is to run smoothly. On the boards of several of the semi-public authorities controlling the big ports, such as London, Southampton, Harwich, and certain others, the Elder Brethren of Trinity House represent the interests of safe navigation and other concerns of the Corporation. As they are all experts their services are eagerly sought by these authorities and the work they do is of great benefit to shipping. In the Admiralty Court and certain other courts Trinity Brethren sit beside the Judge on the Bench, and under the title “Trinity Masters”, they act as nautical assessors. Although the Judges of these courts have generally been chosen after considerable experience as counsel of such specialist work, they do not pretend to be expert seamen. In collision cases, for instance, especially where there is much conflict of evidence, the expert advice of such highly qualified master mariners is of infinite advantage in helping the Judge on matters of seamanship and other technical points. In some of the courts the Judges would be unable to conduct the eases without the help of the Trinity Brethren. In addition the Brethren are concerned in other spheres where high qualifications and specialized knowledge of the sea are of use to the administration. 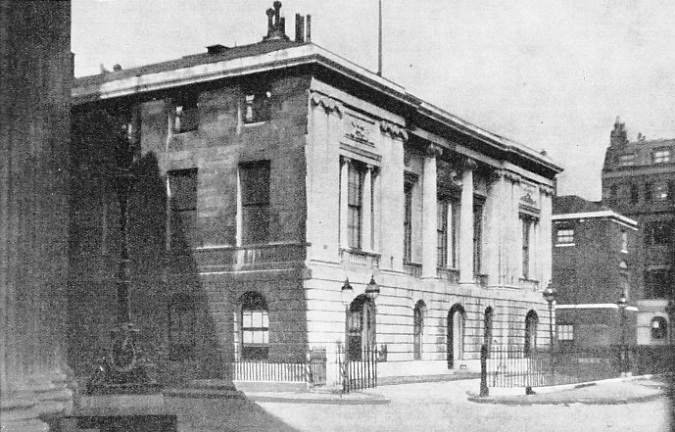 The present Trinity House in Trinity Square, close behind the Tower of London and overlooking the war memorial of the Merchant Service, was opened in 1796. It was designed in the Renaissance style by Samuel Wyatt. The foundation stone was laid by William Pitt, when Master of Trinity House, in 1793. FROM AN UNUSUAL ANGLE. 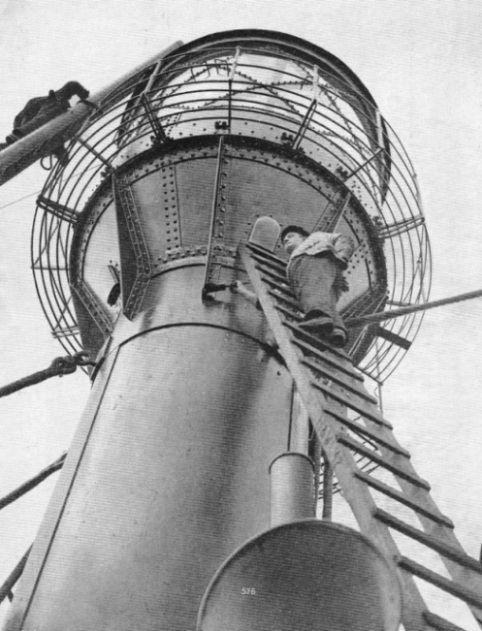 Painters at work on the lantern of the Outer Gabbard Lightship, during her overhaul at the Surrey Commercial Docks, London. The vessel is normally moored about twelve miles off Harwich (Essex). Her light gives four white flashes every fifteen seconds, visible eleven miles. In spite of the unfortunate succession of fires which have destroyed so many of the early records, Trinity House contains an interesting museum, although few people are allowed access to its treasures. Too much work is done inside the building to encourage visitors in large numbers. The various rooms in the building are as busy as those of the most scientifically run factory, yet Trinity House maintains an atmosphere of unhurried deliberation which makes for efficiency. Many of the customs have been handed down for centuries and are none the worse for that. Equally interesting is the Trinity House depot at Blackwall, on the Thames. This has existed for over a century, but has been extended steadily as the work of the House has become more complex. The wharf is conspicuous to passengers in passing ships by reason of the numerous buoys in reserve that are constantly being painted and repaired. Behind the wharf there is a surprising amount of space devoted to the proper care of the chains for lightships’ moorings. In the various shops there is a wide range of machinery for all purposes for repairing the material of Trinity House, for making new fittings, and for generating the oil-gas and storing it in high-pressure cylinders for the numerous gas buoys that function unattended week in and week out. A conspicuous feature is the miniature lighthouse which in days gone by was used for the training of lighthouse keepers before they went on station. Now it is mainly experimental. It would be easy enough to say that Trinity House is a picturesque survival recalling the guilds that were all-powerful in medieval England. But such a remark would betray complete lack of understanding of the multifarious activities of the Corporation. The Master and Brethren of Trinity House carry out difficult work of the greatest importance to the shipping industry. Their tasks are executed with far greater economy than would be possible in a Government department operating in the traditional manner. RELIEF FOR THE HELWICK LIGHTSHIP in the Bristol Channel in choppy seas. However stormy the weather may be, Trinity House must maintain efficient navigation marks to guard the safety of shipping. The Helwick Lightship shows a white flash every thirty seconds and carries a ball at her masthead. She is here seen flying the famous Trinity House flag. You can read more on “Day and Night Signals at Sea”, “Pilots and Their Work” and “Signalling at Sea” on on this website.